A small fishing village, surrounded by some of the world’s most spectacular costal scenery and formations, welcomes you to Best Western, Great Ocean Road. Guests are central to Port Campbell area attractions including historic shipwreck sites and limestone cliffs – some of the best-known landmarks in Australia. Within walking distance, find a swimming beach, jetty, restaurants, specialty shops and museums as well. Spacious accommodations feature pitched timber ceilings and modern with spa baths. Decks off the kitchenettes and living spaces offer indoor-outdoor gathering spaces. 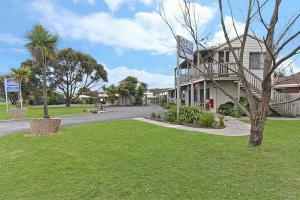 46 miles from the Warrnambool Airport.